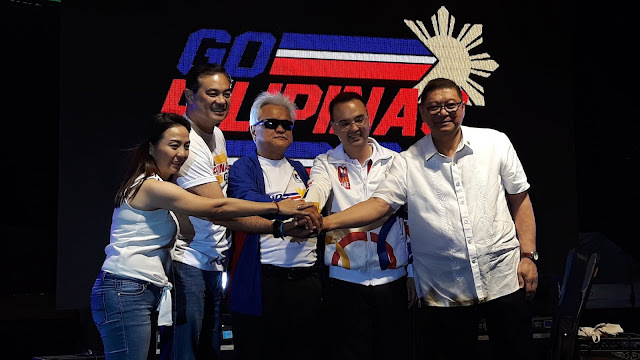 MANILA--Philippine SEA Games Organizing Committee (PhiSGOC) chairman Alan Peter Cayetano led the country's athletes and officials as they launched Go Pilipinas Go at the historic Rizal Memorial Baseball field, Tuesday evening. The said event will serve as a launchpad for the country's hosting of the 30th Southeast Asian Games this coming November 30th. "It's easy to win as one, but it's tough winning as one. It's the opportunity to jumpstart President Duterte's program [for sports]," PhiSGOC chair Cayetano said. "First, we must win. We want to have the 10 other countries be impressed in our hosting," he added before the athletes and officials present. Women's World Bowling Champion Bong Coo kicked off with an inspiring message to the athletes in the upcoming SEA Games with faith and full determination. Philippine Chef de Mission Monsour Del Rosario recalled his experience in competing for the country. "Kahit knocked out na, nakatayo pa rin ang Pilipino. Handang makipagsabayan sa ibang mga atleta," he recalled. Also present in the pep rally are PSC Commissioners Ramon Fernandez, Sonia Kiram, Charles Maxey and Arnold Agustin. Multiple medalists Hidilyn Diaz and Nikko Huelgas also shared their hopes and aspirations in the coming SEA Games through separate video messages.